The newest version of the software for the Apple Watch. Available for all Apple Watch models except the original, watchOS 5 brings Walkie-Talkie, a Competition activity option, Siri Shortcuts and new Siri face options, interactive notifications, and more. Subscribe for regular MacRumors news and future watchOS 5 info. Introduced at the 2018 Worldwide Developers Conference, watchOS 5 is the current version of watchOS, the operating system that's designed to run on the Apple Watch. With watchOS 5, Apple focused on introducing new ways for you to stay active and connected to the world around you. 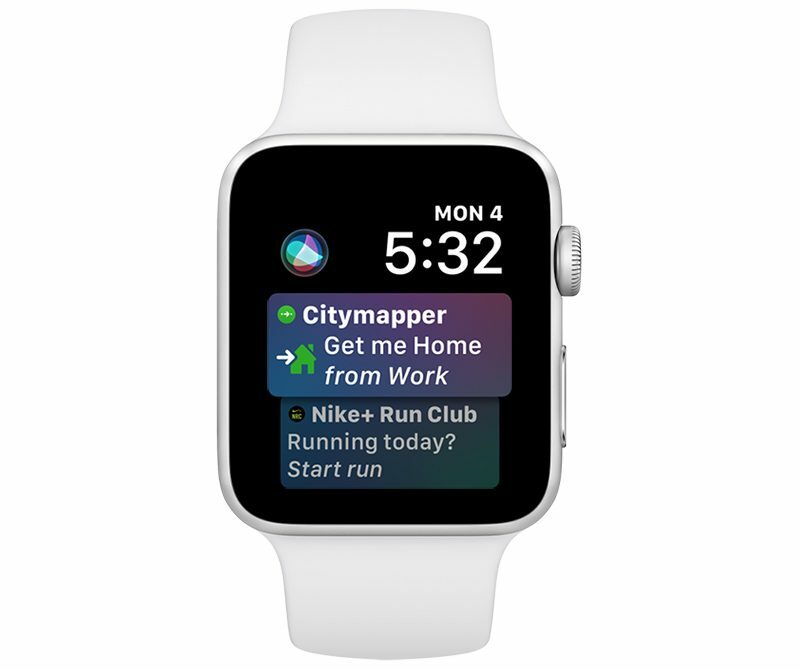 The headline feature in watchOS 5 is a Walkie-Talkie app, which introduces a new way to communicate on the watch by merging real-time voice conversations with the spontaneity of messaging. The Walkie-Talkie app works like a traditional Walkie-Talkie, with press-to-talk communication with your friends and family. To motivate you to work out, watchOS 5 brings a new Competition option that lets you challenge your friends to a seven-day competition to see who can earn the most activity points. Regular progress reports let you know where you and your friends stand, with the winner receiving a special award. Several new workout types have been added, including Yoga and Hiking, while Outdoor Runs have gained support for rolling mile pace, custom pace alert, and cadence for better tracking capabilities. In watchOS 5, automatic workout detection means your Apple Watch won't fail to start or stop recording your activity when you're working out. Automatic workout detection works with Outdoor Run, Indoor Run, Outdoor Walk, Indoor Walk, Elliptical, Rower, Pool Swim, and Open Water Swim. The Siri watch face is better than ever in watchOS 5 with support for sports, maps, heart rate, third-party app support, and Siri Shortcuts, a feature also coming to iOS 12. With Siri Shortcuts, the Apple Watch offers up actionable, dynamic shortcuts based on your own iPhone and Apple Watch usage habits. Speaking of Siri, you no longer need to say "Hey Siri" to the Apple Watch with watchOS 5. Instead, you can just raise your wrist to speak to Siri. 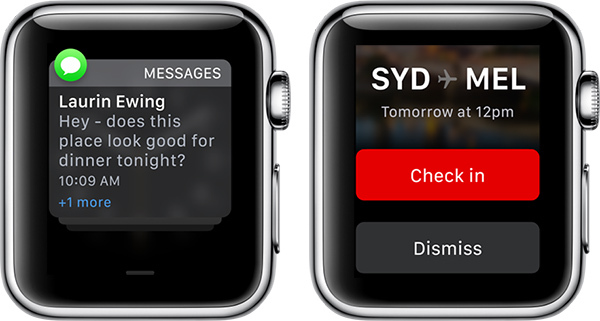 Notifications are smarter and more interactive in watchOS 5 with actionable options for doing things like checking into a flight, paying for a ride, or booking a table right from an incoming notification on your wrist. Notifications are also grouped in more convenient ways. 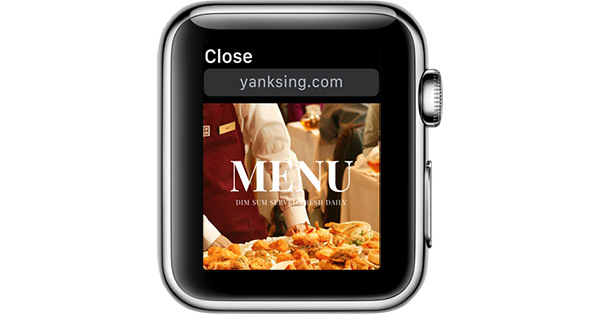 watchOS 5 integrates WebKit for the first time, so you can view some website content from apps like Mail or Messages on your wrist, with the option to click on links and load sites on the Apple Watch. It's not full Safari support, but it lets you do more without having to open up your iPhone. 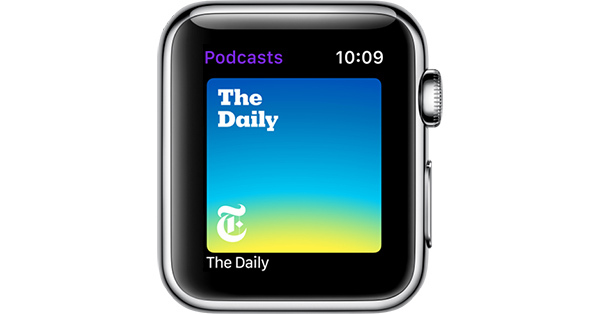 Podcasts are now available on the Apple Watch in a dedicated Podcasts app that syncs with the Podcasts app on your iPhone, and there's a Podcasts complication. Several other features have been included in watchOS 5, like Memories in the Photos face, wind direction, wind speed, UV index, and air quality in the Weather app, an emoji picker, scheduled Do Not Disturb options, a customizable Control Center, and the ability to answer a FaceTime video call as audio without needing the iPhone. Apple released watchOS 5 on September 17, 2018. The software runs on all Apple Watch models with the exception of the original first-generation Apple Watch, which does not support watchOS 5. The current version of watchOS is watchOS 5.2, released to the public in March 27. watchOS 5.2 brings ECG functionality to Hong Kong, the UK, and 18 other European countries, and it adds support for AirPods 2. Apple has also seeded the three betas of watchOS 5.2.1 to developers for testing purposes. watchOS 5.2.1 is a minor update that appears to focus on bug fixes and other under-the-hood changes. 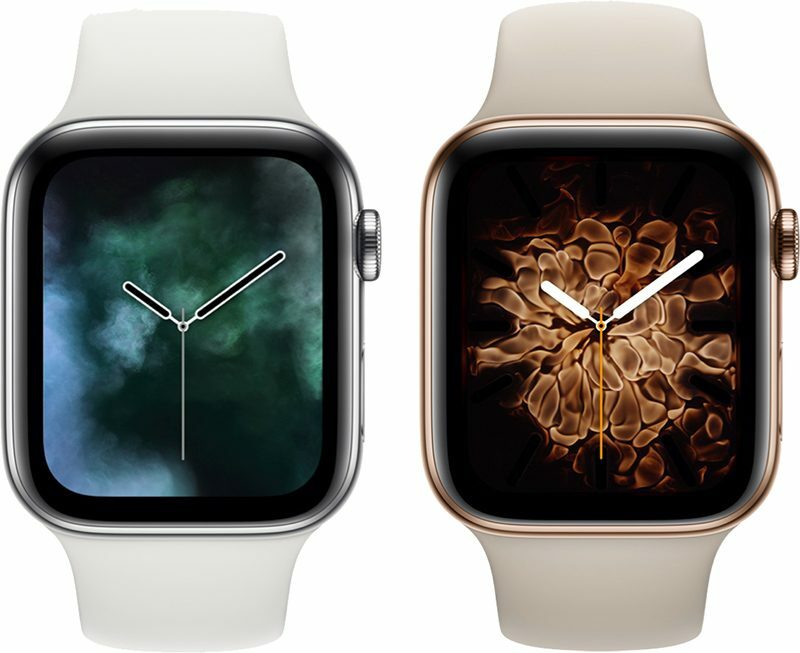 watchOS 5 introduces several watch faces for both Series 4 Apple Watch models and earlier Apple Watch models. There's a Breathe watch face that's designed to accompany the Breathe app, which walks you through breathing exercises for relaxation and stress reduction. There are three animations for the Breathe watch face: Classic, Calm, and Focus. Three motion faces are also included, which shift and flow when you raise your wrist or tap on the display. There's a Fire & Water option, a Vapor option, and a Liquid Metal option. With the Photos face, you can display curated moments from the photo library using the Memories option, and as outlined below, there have been several improvements made to the Siri watch face. Apple has introduced two new complications: one for Podcasts and one for the Walkie-Talkie app, both of which allow the apps to be opened up with a tap. One of Apple's major focuses for the Apple Watch is fitness, and watchOS 5, like previous versions of watchOS, introduces new activity and workout functionality to motivate you to move more and to better track your fitness activities. In the Activity app, there's a "Compete" option that you can activate with any of your friends who are sharing their activity information. Choosing to compete launches a 7-day activity competition where each person earns points by filling their Move, Exercise, and Stand rings each day. Whoever earns the most points during this period wins the competition, receiving an in-app award. Competitions are designed to give competitive Apple Watch owners more motivation to work out by pitting them against a friend. Both participants receive progress updates and alerts throughout the week to spur them on during the week-long event. Automatic workout detection, a new feature in watchOS 5, lets the Apple Watch detect when you begin an exercise routine, even if you forgot to hit the Workout button to select your workout. Apple Watch pings you with a reminder to start your workout, and once you do press start, it gives you retroactive credit for the movement you've already completed. If you forget to stop a workout after you're done, the Apple Watch detects that too and sends you a suggestion to end the workout. 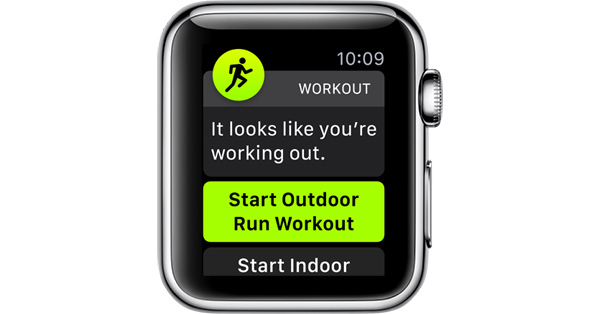 Automatic workout detection works with outdoor run, indoor run, outdoor walk, indoor walk, elliptical, rower, pool swim, and open water swim activity types. 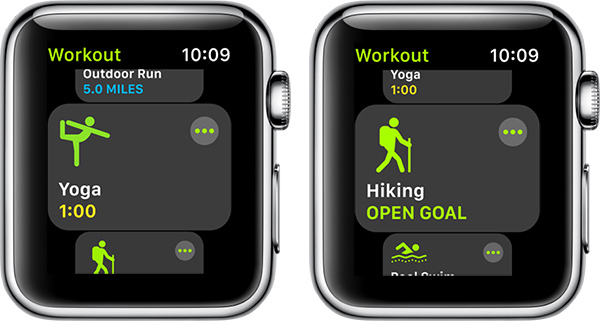 Apple has introduced new workouts for hiking and yoga in watchOS 5, both of which use custom algorithms to calculate your calorie burn. The updated Yoga Workout works primarily from heart rate and can be calibrated to your fitness level, providing more accurate tracking of yoga-based workouts. Hiking, a new workout type, takes into account pace, heart rate, and elevation gain to provide accurate exercise credit when hiking on steep terrain. In addition to new Hiking and Yoga Workouts, the Outdoor Run option has been enhanced with several improvements that make it much more useful for runners. The new rolling mile pace lets you know how fast you ran the immediately preceding mile, while cadence provides a reading of steps per minute. 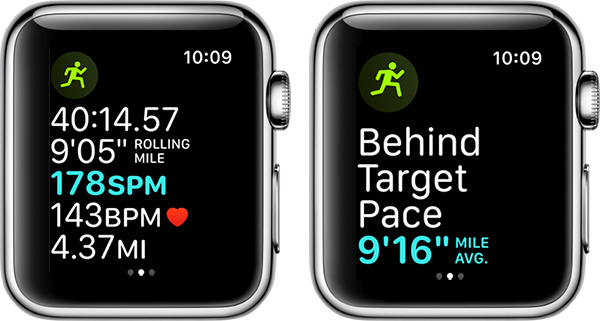 A custom pace alert can also be set, with the Apple Watch giving you a tap when you're above or below your set pace. With Walkie-Talkie, the Apple Watch is gaining an entirely new communication method, which, as the name suggests, is just like old school walkie talkies that let you communicate with friends using push-to-talk functionality. Unlike a traditional walkie talkie, Apple's Walkie-Talkie app works over any distance, combining real-time voice with the spontaneity of text messaging. With Walkie-Talkie, you can send a request to a friend to enable the Walkie-Talkie feature, and from then on, you can simply press on the Walkie-Talkie button in the Walkie-Talkie app to beam your voice from your Apple Watch to your friend's Apple Watch. Walkie-Talkie works over cellular or Wi-Fi, and Apple has designed it with high-quality audio so your Walkie-Talkie conversations are crisp and sharp. Walkie-Talkie audio overrides silent settings and Theater Mode, but there is an option to set yourself as unavailable to mute incoming connection attempts from friends. Make sure to check out our Walkie-Talkie walkthrough for additional details on the feature. In watchOS 5, the Apple Watch features a dedicated Podcasts app that lets you listen to Podcasts without the need for an iPhone to be nearby. Podcasts on Apple Watch syncs with the Podcasts app on iOS and keeps your place no matter which device you're listening on. You can also ask Siri to play your favorite podcasts, and new episodes are automatically refreshed as they're added to subscribed shows. Siri, and more specifically the Siri watch face, is better than ever in watchOS 5 thanks to the addition of sports, maps, and heart rate content, which is now displayed alongside other content on the Siri watch face. In iOS 12, Apple introduced a Siri Shortcuts feature that offers up personalized, smart suggestions for apps you might want to use, and those Siri Shortcuts are also available on the Apple Watch. What's neat about Siri Shortcuts is that they work with third-party apps, which means your watch is a lot better at suggesting things you might want to do or see. Predicted Shortcuts show up right on the Siri watch face, letting you complete tasks like turning on a specific HomeKit scene, ordering a coffee in a favorite app, logging a meal at dinner time, or starting a walk. Like existing Siri suggestions, Siri Shortcuts appear based on when you normally do an action, so you'll see dynamic Shortcut options that change throughout the day. To execute a Shortcut, simply tap on it on the Siri watch face to complete the proffered task without needing to pick up an iPhone. With the addition of new data sources, the Siri watch face can include info from the following Apple apps and services, along with third-party apps: Activity, Alarms, Breathe, Calendar, Favorite Teams (from the TV app), Heart Rate, Home, InCallService, Mail, Maps, MessagesViewService, Music, News, Now Playing, Phone, Photos, Podcasts, Reminders, Stocks, Stopwatch, Timer, Voice Memos, Wallet, Weather, and Workout. You can customize which apps (including third-party) show up on the Siri watch face through the Apple Watch app on the iPhone. Also new in watchOS 5: You no longer need to say "Hey Siri" to activate Siri. Instead, just raise your wrist and speak. 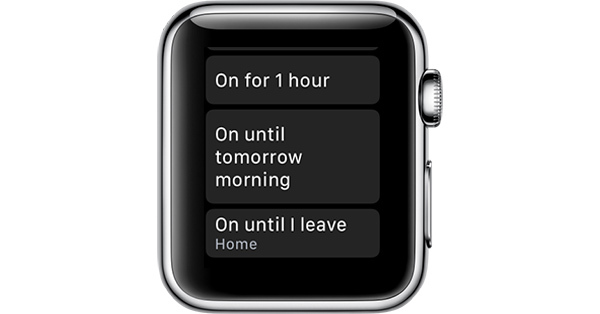 There's also a new shade of gray that you can choose to use with the Siri watch face instead of the purple shade. Notifications in watchOS 5, like iOS 12, are now grouped up and much less messy. Incoming notifications from the same app are grouped together, so you can scroll through them more quickly. A tap opens up all of the notifications in a group, while a press brings up an option to clear them all at once. watchOS 5 also brings actionable, interactive notifications that let you complete tasks right on your wrist. If you get an incoming notification from an airline, for example, you can check in to your flight without needing to open up your iPhone. iOS 12 notification features like Deliver Quietly and Instant Tuning are available on Apple Watch to let you adjust your notification settings right on your wrist. Web Content - watchOS 5 introduces WebKit integration for the first time, which means limited content from Safari is available to view on the Apple Watch. You can now tap on links in apps like Mail or Messages to view things like menus or HTML emails without needing the iPhone. Apple doesn't think full browsing on the Apple Watch makes sense, but there are times when it's convenient to view web content on the watch. All web content for Apple Watch is formatted for the small screen and uses Reader Mode whenever possible. Do Not Disturb - New Do Not Disturb actions are available in Control Center, letting you choose to turn Do Not Disturb on for a set period of time or until you leave your current location. These options were also included in iOS 12. Customizable Control Center - If you scroll down to the bottom of the Control Center on Apple Watch, there's now an "Edit" button that you can use to customize how the Control Center icons are arranged. This allows you to put what you use most front and center. Group FaceTime Calls - Incoming FaceTime video calls can now be answered with FaceTime Audio instead of the Apple Watch displaying a message that you need to answer a call on the iPhone. 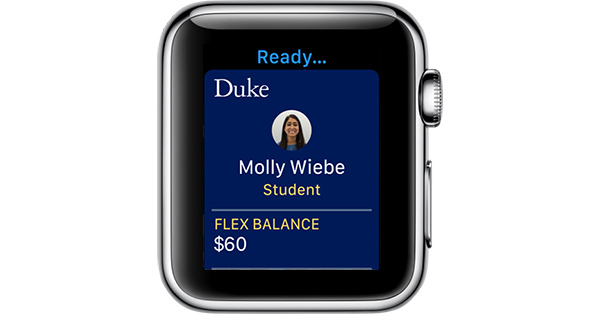 Student ID Cards - Mirroring an iOS 12 feature, Student ID cards can be stored in the Wallet app on iPhone and Apple Watch to be used for access to the dorm, gym, library, and more at participating universities. Siri Volume - You can tweak the volume of Siri in the Settings app. Photos Watch Face - The Photos watch face now displays Memories pulled from the iPhone's Photos app. Solar Watch Face - You can use two complications with the solar watch face, instead of just one. Weather - As with the Weather app on iPhone, the Weather app on Apple Watch now offers info on air quality, wind speed, UV index, and wind direction. You can also now add cities right on the Apple Watch. Wi-Fi - You can turn off Wi-Fi in the Settings app and choose a Wi-Fi network. Now Playing Widget - The face of the Apple Watch displays a Now Playing icon when AirPlay 2 music is playing on the network and can be controlled via the Now Playing interface on Apple Watch. Heart rate - watchOS 5 brings an option to be notified if your heart rate fall below a specific threshold if you've been inactive for a 10-minute period. watchOS 5 is compatible with Series 1, Series 2, and Series 3 Apple Watch models. It does not work with first-generation "Series 0" models, which were the first Apple Watch models Apple released.